Boeing is bringing retired workers back on the job as the world's largest planemaker tries to fix delays at its 737 jetliner plant outside Seattle, a union official has told Reuters. 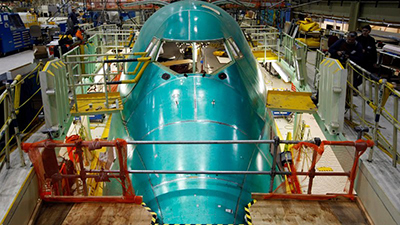 The snarl at its plant in Renton, Washington was triggered by shortages of engines and fuselages as Boeing sped production to record levels in June. It is likely to hurt third-quarter results and threatens its goal to boost build rates again in 2019, some analysts said after meetings in the Seattle area last week. Single-aisle aircraft like the 737 and Airbus A320 families are the cash cows of the world's two largest aircraft manufacturers. Investors will get a peek today at how far behind Boeing is when it releases its order and delivery tallies for August, a month after deliveries fell to the lowest level in years. Deliveries are crucial to planemakers because that is when airlines pay most of what they owe for the aircraft. Boeing started hiring retired mechanics and inspectors on a temporary basis after reaching an agreement with the International Association of Machinists and Aerospace Workers on August 15, a union spokeswoman said. Boeing had a similar agreement with the union last autumn following a round of voluntary layoffs, the spokeswoman added. Boeing largely attributes the snarl to shortages of fuselages from Kansas-based Spirit AeroSystem and engines from CFM International, a venture between France's Safran and General Electric. "We are working closely with our suppliers Spirit and CFM as they track toward recovery, as well as our customers," Bergman said. "Our team has been mitigating supplier delays, and our factory continues to build 52 airplanes per month." Among airlines with large 737 fleets, American Airlines Group has seen slight delays on a small number of 737 MAX deliveries, while the fourth biggest US carrier Southwest Airlines sees "minor changes" on future deliveries, but the delays have not disrupted operations, company representatives said. Aircraft leasing company Air Lease was still seeing 737 delivery delays of "a month or less," a spokeswoman said.